Spring is in the air…and that means time for cheers…after all, the first beer or wine is on us – as part of the first networking social event of the year. But beyond the complimentary beverage, this is a long-awaited opportunity (or excuse) to reconnect with old friends from the industry…and connect with new ones, as well. 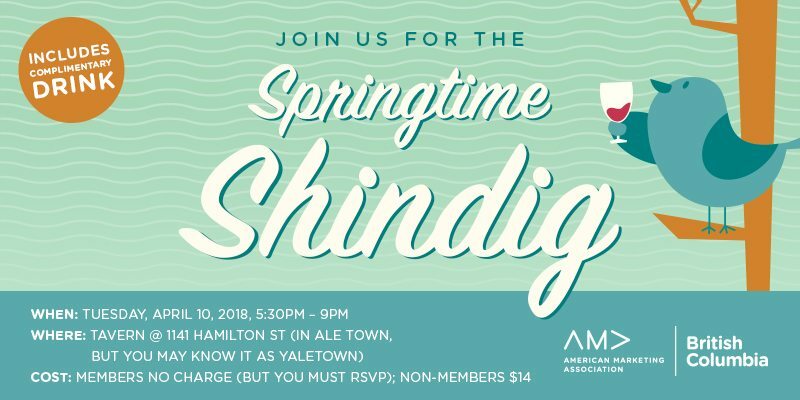 So be sure to join us on the evening of Tuesday, April 10th for the BCAMA’s annual Springtime Shindig. In addition to the complimentary beverage and delectable appies, admission is also free for all BCAMA Members…and just $14 for everyone else. Space is limited, though, so be sure to RSVP and/or register as soon as you can. And remember, marketers don’t leave marketers behind… so go on and text, tweet or ping the rest of your industry crew and get ready for a spring interaction. We look forward to reconnecting & meeting you!